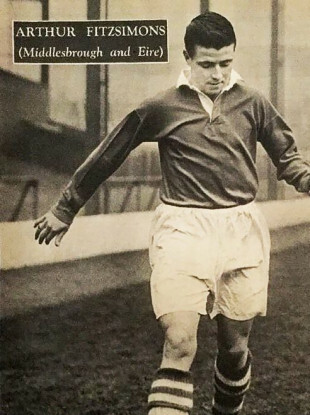 Fitzsimons played over 200 times for Middlesbrough after joining the club in 1949. THE FOOTBALL ASSOCIATION of Ireland has led tributes to former international and Middlesborough footballer Arthur Fitzsimons, who has passed away aged 88. The Dubliner, who was inducted into the FAI’s Hall of Fame in 2009, made over 200 appearances for Boro in a playing career which began at Shelbourne and featured 15 years in England. Later managing both Drogheda and Shamrock Rovers in the late 1960s, FAI CEO John Delaney highlighted Fitzsimons’ deep ties to the League of Ireland speaking this afternoon. “Arthur was a proud League of Ireland man and maintained his connection to the domestic game throughout his career,” he said. Born in the shadow of Shelbourne Park in Ringsend, Fitzsimons began his career with the Reds before a move to Ayresome Park, where his team-mates included Brian Clough and Wilf Mannion at Middesborough. FAI pays its respects to Arthur Fitzsimons. He later took in spells at Lincoln City, Mansfield Town and Crusaders, before a return home saw him play and later manage Drogheda. The player also made 26 appearances for Ireland, making his debut in 3-0 victory against Finland at Dalymount Park in 1949, scoring seven goals during a decade-long international career. “We send our deepest condolences to Arthur’s family and friends at this time and we will remember Arthur at an international game that is suitable for his family,” added Delaney. Email “'He was a true gentleman' - FAI lead tributes to former Ireland international Arthur Fitzsimons”. Feedback on “'He was a true gentleman' - FAI lead tributes to former Ireland international Arthur Fitzsimons”.